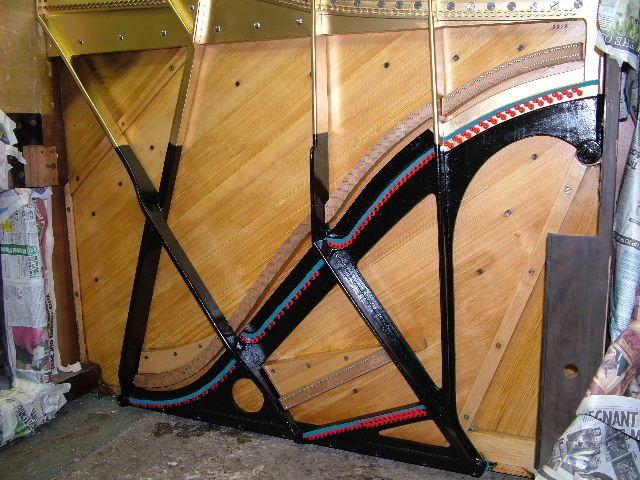 Frame: Prior to restoration, the iron frame is dirty, the paint is chipped and the felts are dusty and worn. 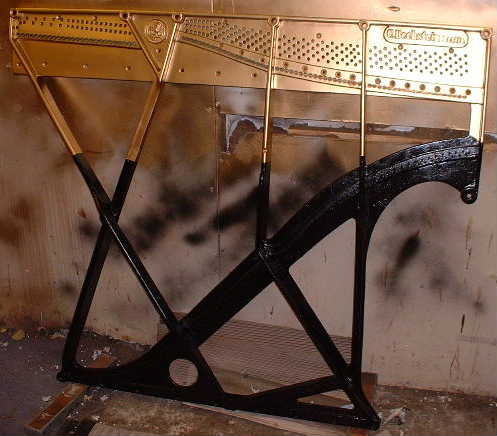 The frame is removed from the piano and rubbed down, before being resprayed in gold and black. 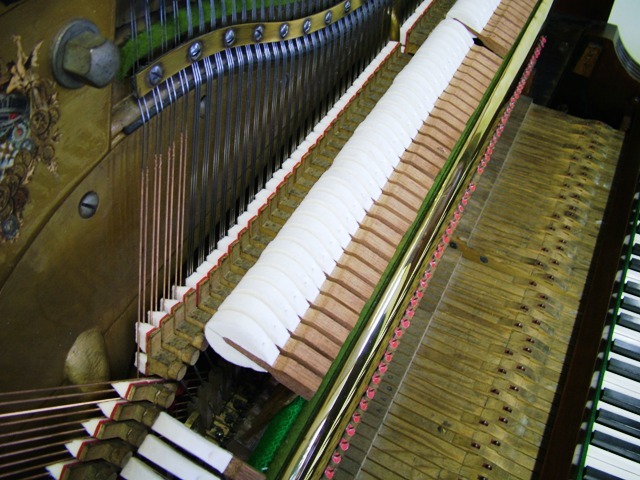 After being returned to the piano, new felts complete the job, and the piano is ready to be restrung. 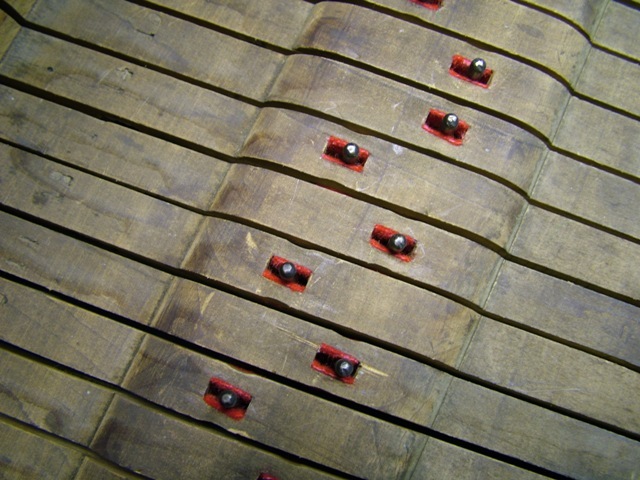 Soundboard: Cracks in the soundboard can produce unwanted creaks and buzzes when the piano is played. 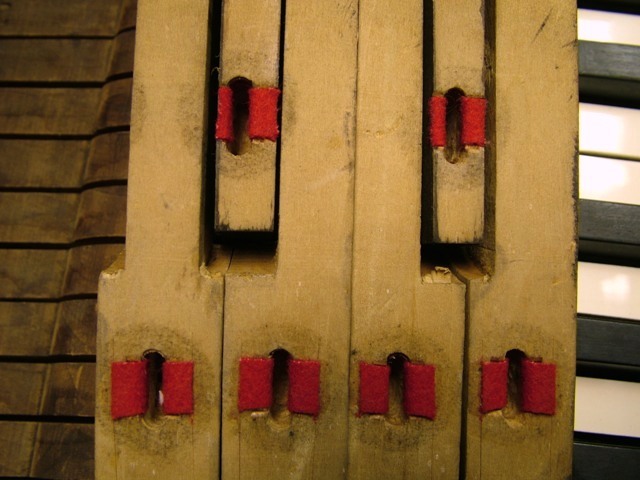 Whilst the frame is out of the piano, the cracks are repaired using wooden shims. 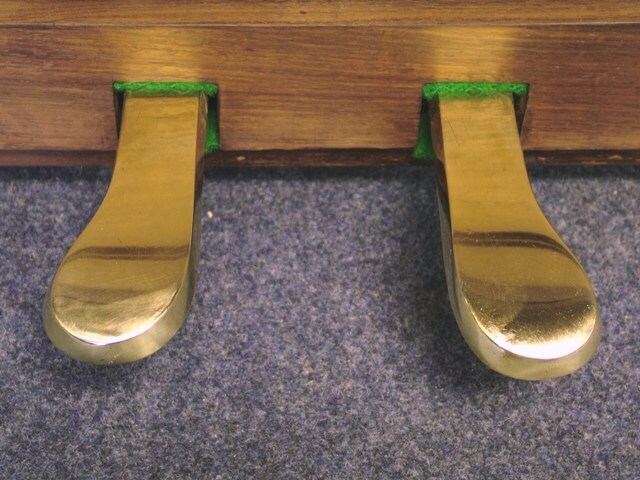 The soundboard is then sanded down and repolished, leaving a soundboard which is free of cracks and attractively finished. 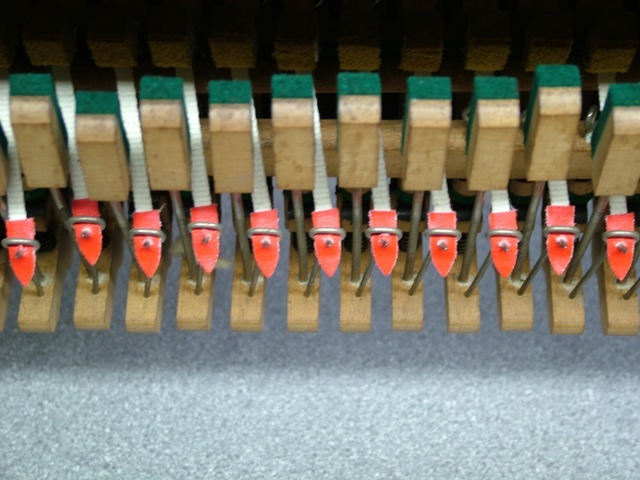 Restringing: Before being removed, the old strings and tuning pins must be carefully measured to ensure that the new ones are a perfect match. 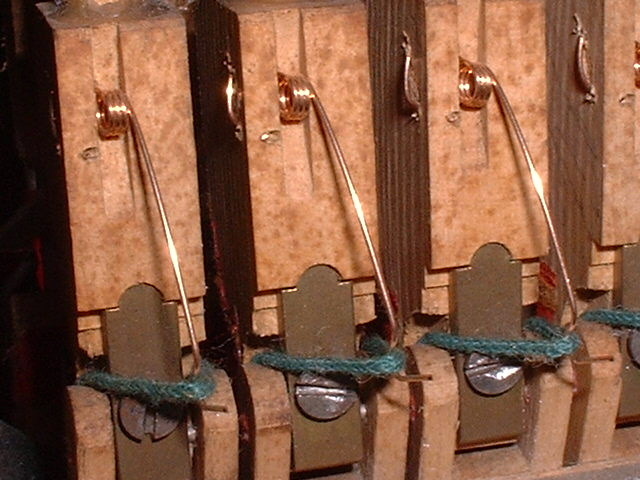 Copper wound bass strings are made to order for each individual piano. New strings and tuning pins offer a pure and consistent tone, as well as providing tuning stability. 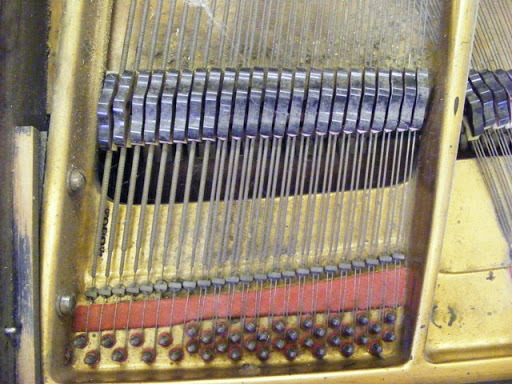 Upright Action: Over years of use, parts in the piano action will become worn or broken. These parts must be renewed for the action to function correctly. 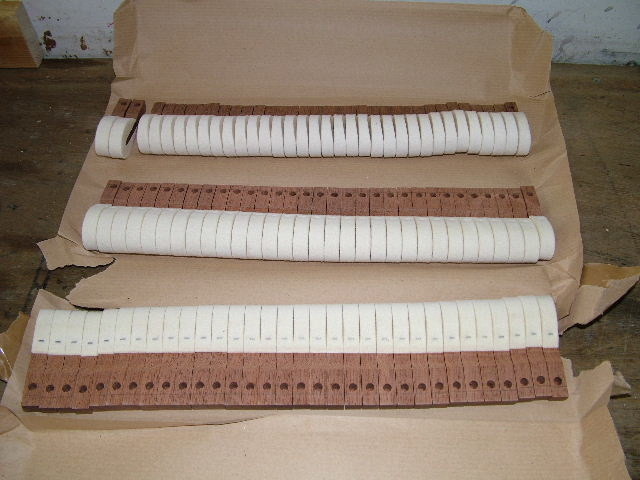 Examples of common action restoration include replacement of return tapes and balance head leathers. 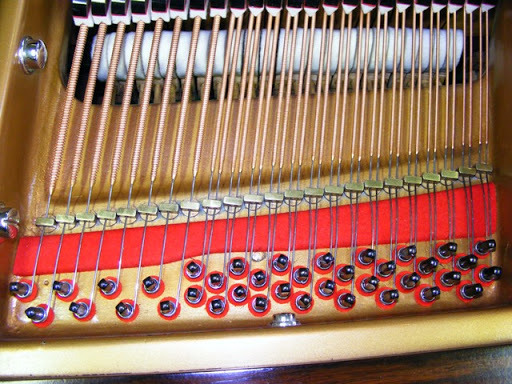 There are thousands of parts in a piano action, so thorough checks are necessary to ensure that any worn or damaged parts are identified and repaired or replaced. 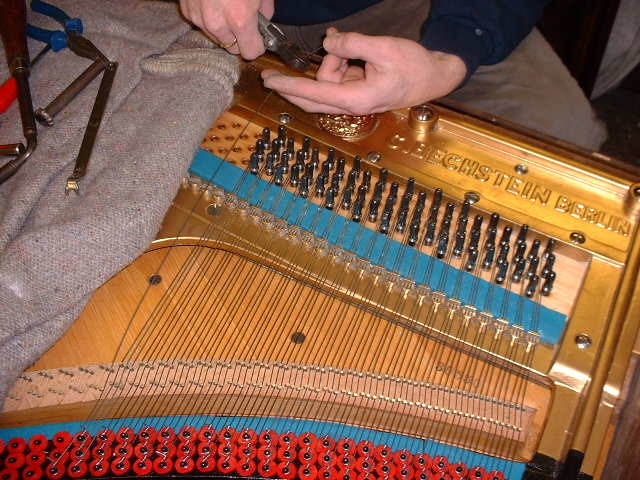 Just a few of the parts that might need replacing include various springs, or even an entire set of damper felts. 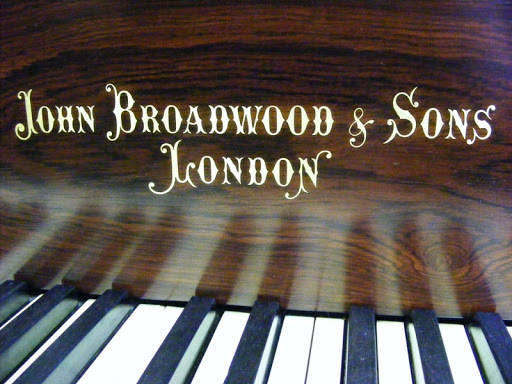 Grand Action: As with an upright action, any worn or damaged parts must be repaired or replaced for the piano to perform at its best. 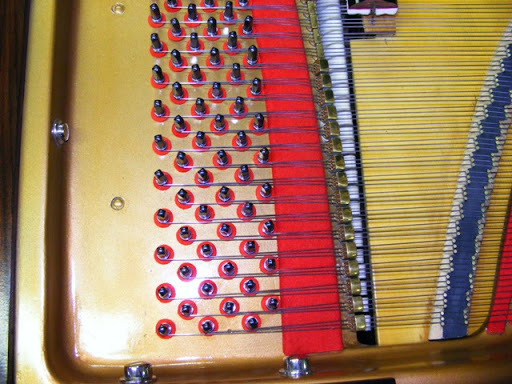 Replacing any loose centre pins is essential to prevent wobbling or clicking, whilst a new set of rollers can greatly improve the touch of a grand piano. 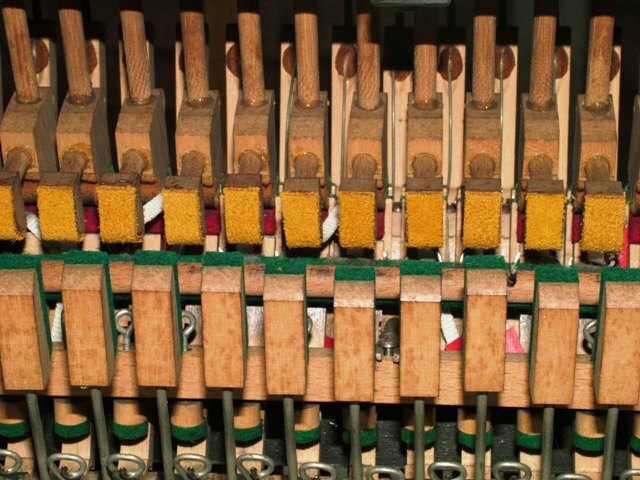 Hammers: The hammers on a piano are fundamental to producing a quality tone, and worn hammers will never provide the nicest possible sound. 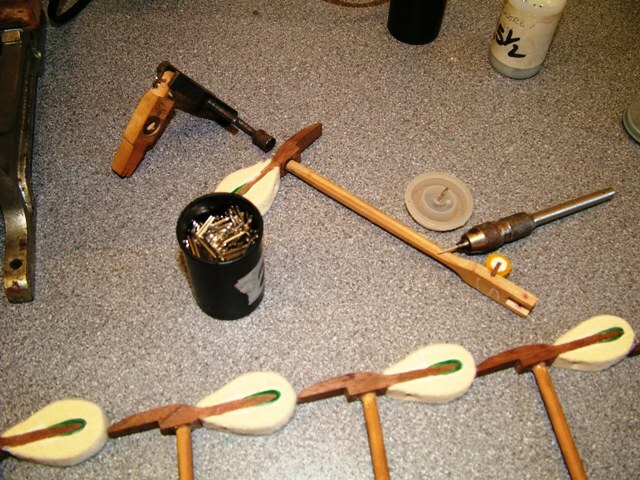 Old hammers are removed, and a new set is made to order. 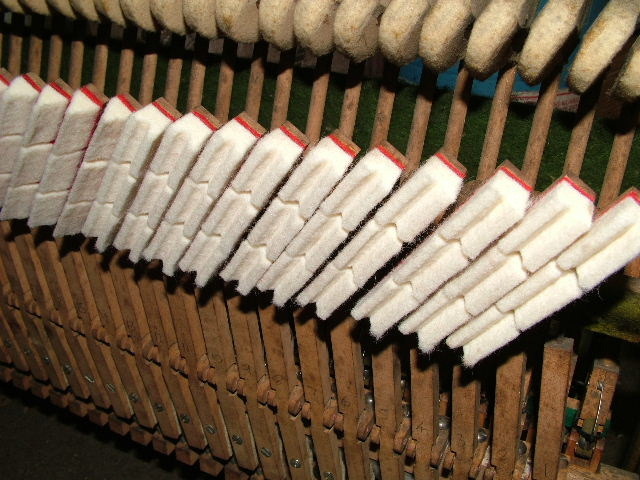 Alternatively, the existing hammer heads may be re-covered with new felt. 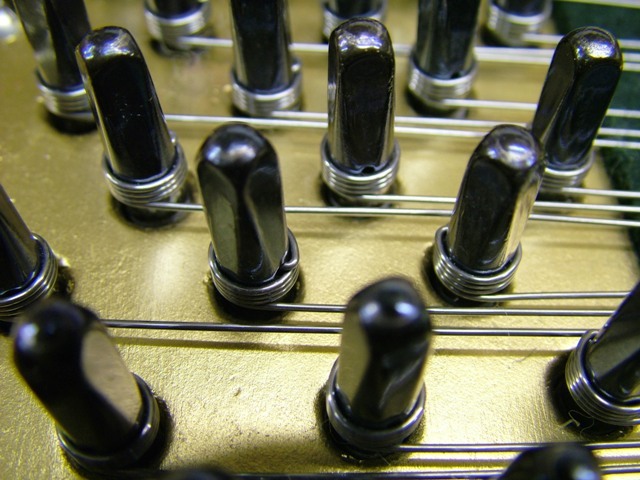 Key Bushing: The key bushings prevent the keys from rattling on their pins, and ensure a smooth and easy movement. 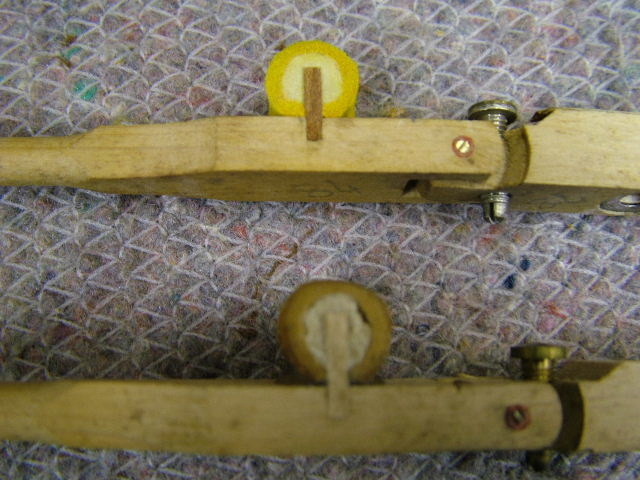 Worn bushings can cause wobbling or sticky keys. 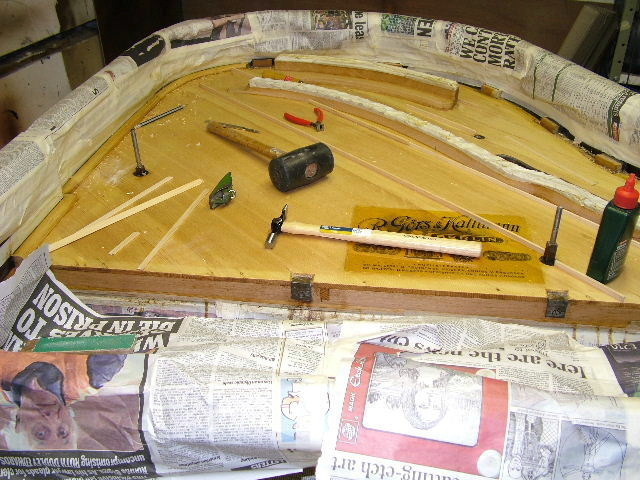 Old bushings are removed and new felts glued in place. 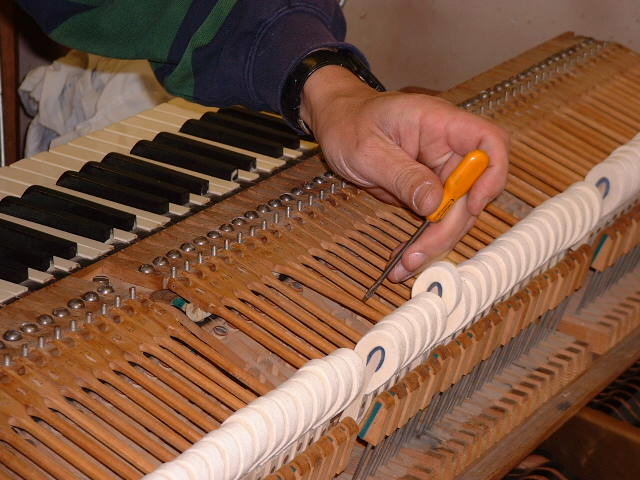 Regulation: Once the internals of the piano are reconditioned, the final job is to regulate the action. 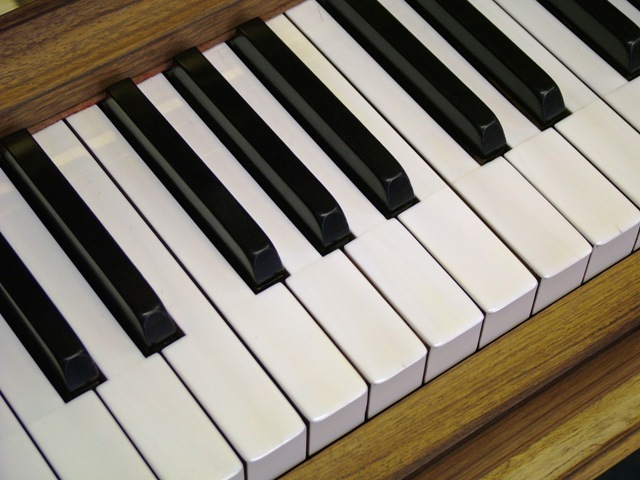 This ensures that the action works perfectly on each and every note. 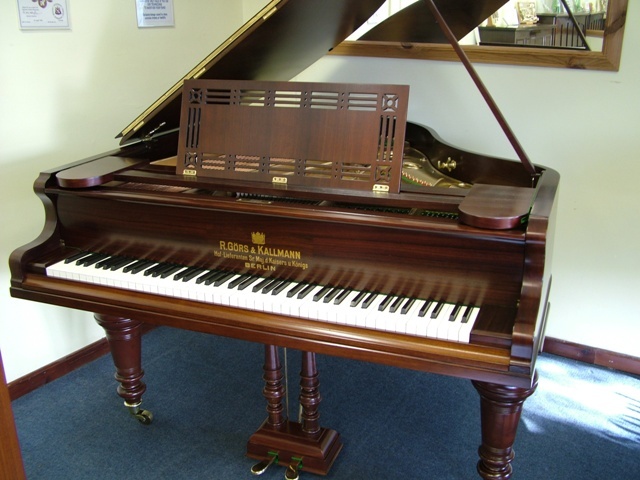 Regulation is essential for both upright and grand pianos if the touch is to be consistent and responsive. 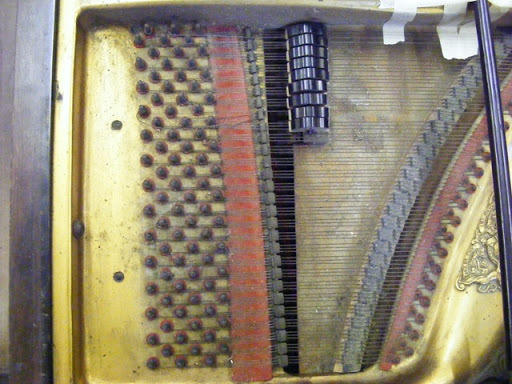 Casework Stripping: When pianos arrive at the shop, the casework is often in a poor state. The polish suffers from chips, dent, cracking and fading. 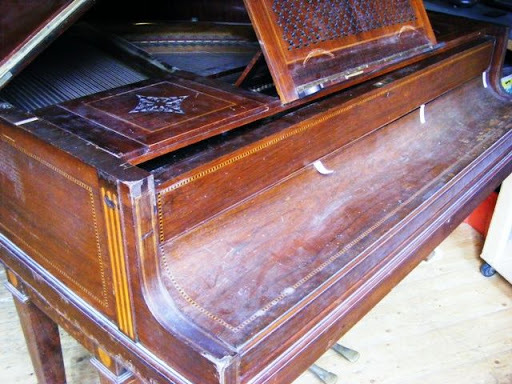 The first job is to take the piano apart, and strip off all of the old polish. 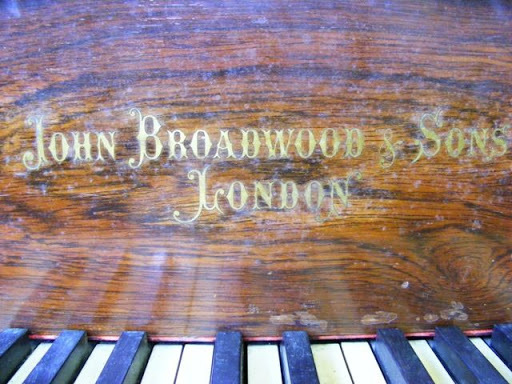 The bare wood is exposed, and all but the very worst damage is removed at this point. Casework Preparation: The next job is to wash down the wood with a dewaxing and degreasing solution. 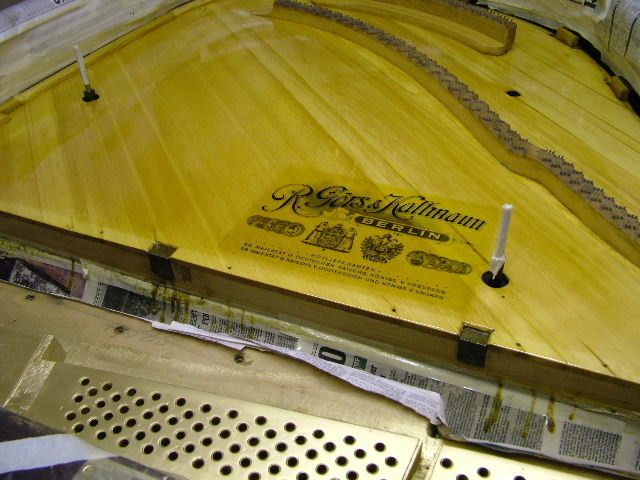 A thick paste is then worked into the wood to smooth out the natural dips in the grain, providing a flat and even surface on which to apply the polish. 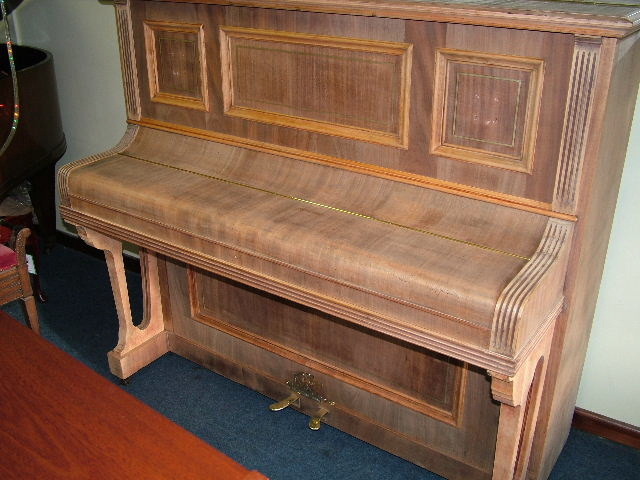 Once the grain filling compound has dried fully, the piano is sanded down, ready for the staining and sealing coats to be applied. Casework Polishing: The polishing is done in many layers. 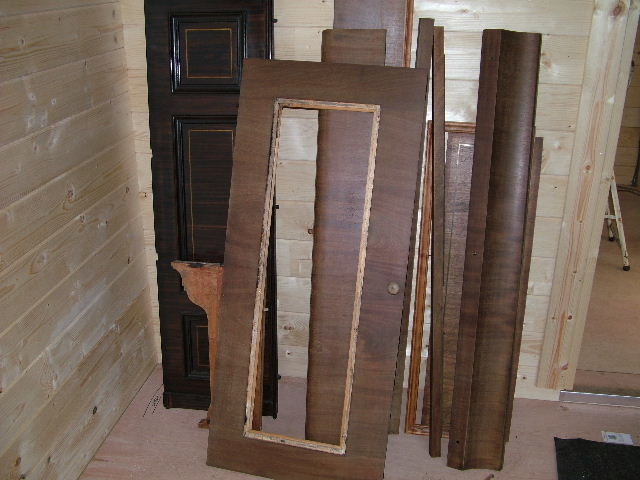 Sealing and staining coats are applied, and the case is sanded before the final finish in either satin or gloss. 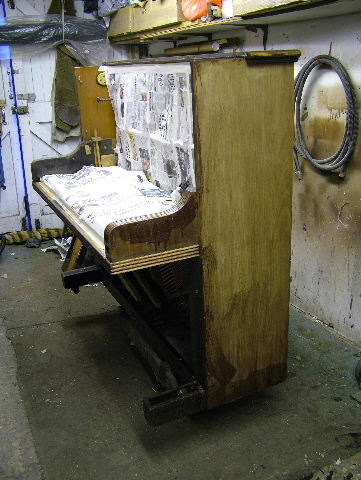 The end result is a piano that is transformed from a tired and worn looking instrument into a beautiful piece of furniture. 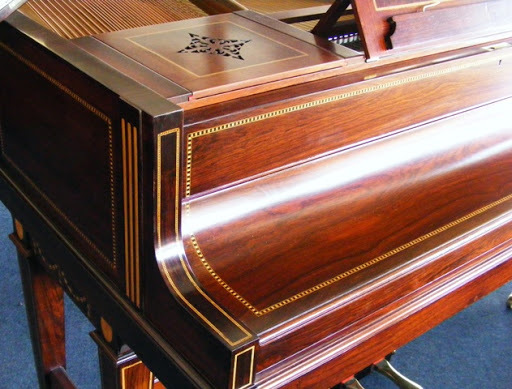 Key Coverings: The piano keys are an essential element of any restoration, as both the feel and appearance are important. 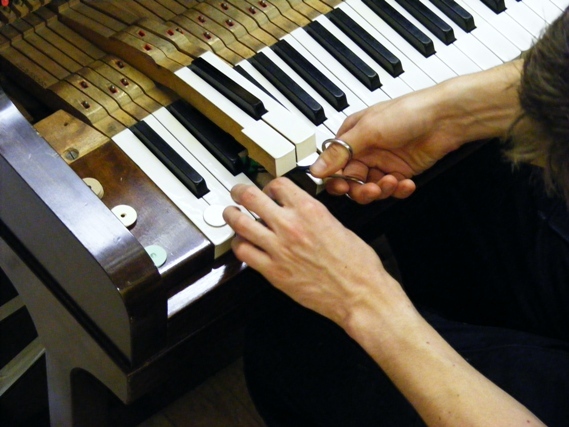 Restoration involves cleaning and buffing the keys, as well as repairing any loose key tops. 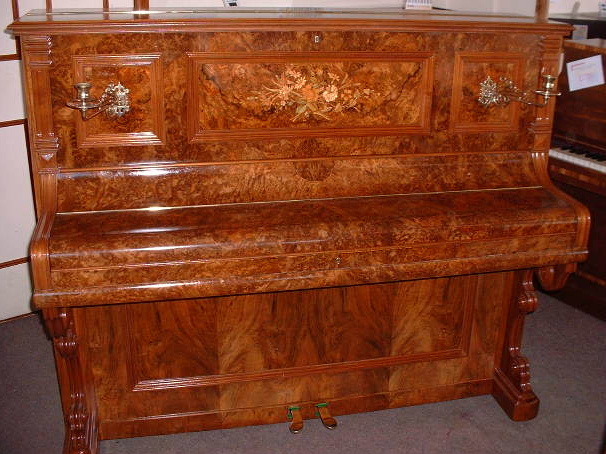 In some cases, the keys will need to be sanded or even scraped to remove imperfections. 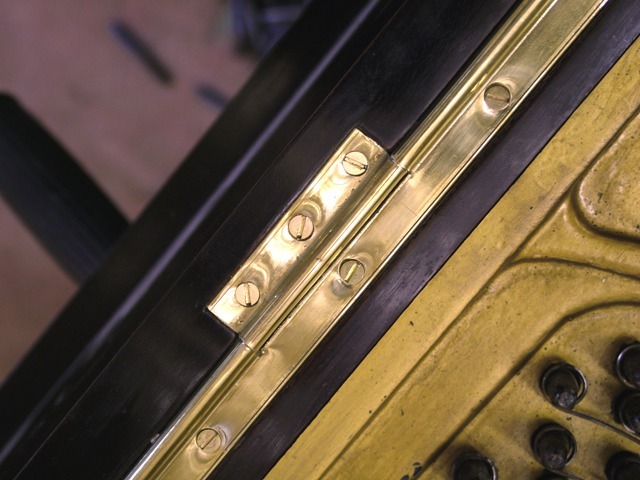 Brasswork: Brass parts on the piano include hinges, lock plates and pedals. These become tarnished over time and let down the overall appearance. The brasses are cleaned up either by hand or on a buffing machine, before a final polish by hand. They compliment an attractive case perfectly.